We’re setting live a brand new feature, meant to enhance your data processing creativity and let you develop unique new ways of looking at keyword rankings. You will now have more flexibility in slicing your data so that it answers all your key questions, regardless of how specific they are. With the new filters we’ve added, there are literally countless data segments you can create, based on semantics or keyword performance. In this article we’ll go through a few examples to see how the filters perform and highlight some of the filter combinations you’ll likely want to use sometime in your work. So, to start using the new filters you’ll need to head over to Ranking > Keywords, where you’ll see all the filters available at the top of your data table. Tip: Filters become available once the data columns are included in the report, so make sure to add to the data table any columns you may need to filter your keyword data by. The first great thing you’ll notice about the new filters is that you can actually set your own value intervals to segment your keyword data by, which makes it extremely easy to create filters that are applicable to the specific values you’re seeing for your various projects. Moreover this allows you to create both fine-grained data segments, as well as to isolate large keyword data intervals, depending on the type of analysis you’re performing. 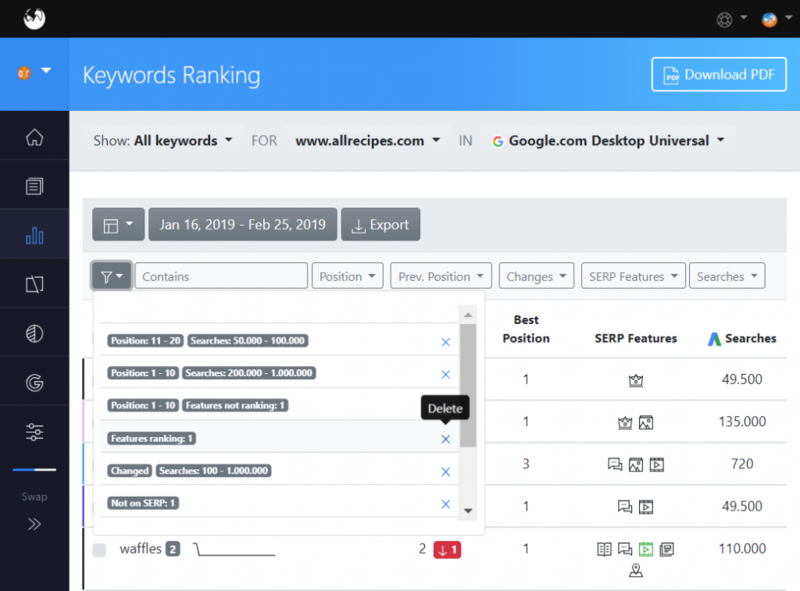 With these new filtering capabilities, you’re no longer limited to the default rankings changes filters that were available up until now for AWR reports, you can make new better ones, more insightful and more in-tune with your clients’ SERP performance. In addition to ranking changes, you can use lots of other criteria to segment keyword data by, not just the keywords’ ranking performance: metrics from Google Search Console, metrics from AdWords Keyword Planner, filter by type of SERP features or by keyword semantic. Another thing that you’ll absolutely love about the new filters, is that once you defined your filter combinations, you can simply save them into your library and access them whenever you need with just one click. Sometimes though, creating very complex and super specific filters for all your analysis needs, also means having a quite large list of saved filters to manage, which may become troublesome for big projects. For that matter another option may be to only save the wider custom filters you create and have them working together to achieve the same result as a very specific one. you can only create and save one custom filter for your top performing keywords (high number of impressions, that have current position on the 1st page of results), and combine it at a time with: previous rankings were on the 2nd, 3rd, 4th page and so on. Once you apply the filters, you will get a fresh list of all the keywords that match the conditions set, for the current date selected. Or if you prefer, you can also create static keyword groups based on your filtered results, by selecting all keywords after applying the filters, and then assigning to keyword groups. Being able to group keywords by performance and then track their evolution as a group is one of the things we are aiming to improve in the following weeks at AWR. In this process, your feedback is fundamental. You will have many suggestions for us, I’m sure, once you’ll give this feature a go, so please drop us a line and let us know what would make your work easier. 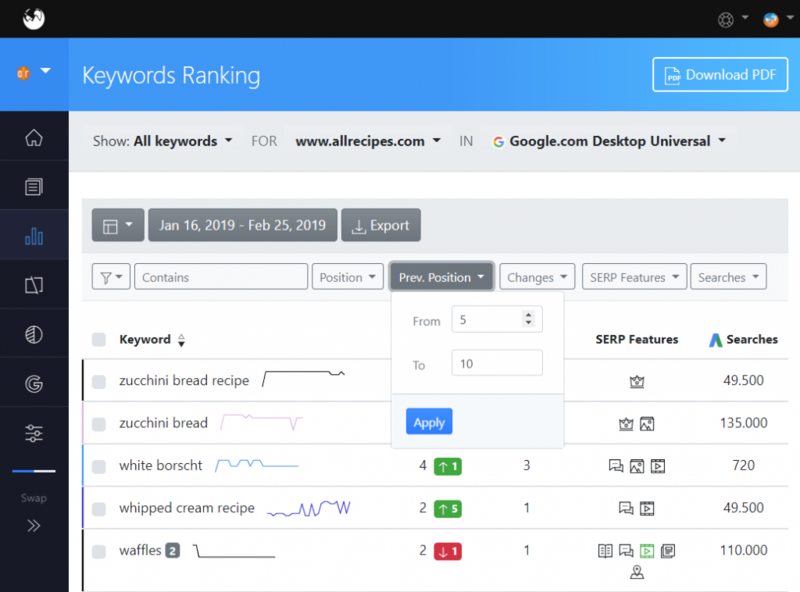 Lastly, you’ll be able to see the value of the new filtering system when side-by-side comparing keyword performance for different search markets or between you and your competitors (the reports available in Comparison menu). Check if keyword ranking drops are consistent across all the SEs you’re focusing on (Comparison menu > Search Engines panel; apply Changes filter, with all targeted SEs added on display). Additionally you can narrow your analysis down to only the top ranking keywords (using the Position filter) or focus on the terms with the highest search volumes (Searches filter). Research the keywords for which your competitors perform best (Comparison menu > Website panel; apply Position filter and sort ascending by the competitor you wish to focus on). Furthermore you can limit your research to the list of terms with the highest potential of driving search traffic and the best Search volumes (Searches filter). This is a lot to explore and a great opportunity to set new ideas in motion. Log into your account to start using the features with your data, and reach back with your feedback and comments. We’d love to hear from you.